I am experiencing an error quite often among my users. The app crashes during startup. When the MainActivity is supposed to be loaded the VM apparently cannot find the class. I cannot figure out why. The architecture of the app is that there is a common project that both my free and pro version are using. Don't know if it is relevant. See the stack trace below. Any thoughts? Edit: Thanks for the comment below, Richard. Now I have changed com.android.Splash to something else. It wasn't the real classname anyway. My bad...! I had the same issue, I did the following to fix the problem. Go to "Properties" of the project. You should see the selected project's "src" and "gen" paths and dependencies here. I switch them, so that "gen" folder is build before the "src"
There was no need to restart the Eclipse. It just started working. Honestly I have never tried "Android Tools > Fix Project Properties", sometimes it might be doing the same thing. I do not know, I just did above after seen the error message, thinking something is wrong with the build paths. Later on it was not sufficient, I was getting the error again. Then I "checked" all the dependencies listed in that view. Now it works again. So far so good. I will keep this updated if it fails again. FYI: in my last attempt, I tried "Android Tools > Fix Project Properties", but it didn't work out for me. Then selecting Build Path -> Link Source to bring up the Link Source dialog. Then I specified the 'src' folder of the Java project and gave it a name other than the default of 'src' (e.g. 'src2'). You can now right-click -> delete the new 'src2' folder. This brought this created Java class files that were compiled for the Dalvik VM instead of the Java VM when the Android project was built. This allowed the Java class files in the Android Library jar file to go thru dexing when the Android project .apk was created. Now when the app was run the Java project classes were found instead of a Java.lang.NoClassDefFoundError being thrown. If you want to use a jar file instead of linking the source, then you will need to create a Library Android project. (An Android Project with 'is library' checked in Properties -> Android.) You will then need to either link the source of the Java Project to the Android Library project as described above or copy the source files from the 'src' folder of the Java Project to the 'src' folder of the Android Library project. Build the Android Library project. Then you will be able copy the Android Project jar file that was created into the 'libs' folder of the Android folder because the class files in it were compiled for the Davlik VM instead of the Java VM when the Android project was built. This allows the Java class files in the Android Library jar file to go thru dexing when the Android project .apk is created. Now when the app is run the Java project classes will be found instead of a Java.lang.NoClassDefFoundError being thrown. Try going to Project -> Properties -> Java Build Path -> Order & Export and ensure Android Private Libraries are checked for your project and for all other library projects you are using. i got the solution by following below link NoClassDefFoundError Android Project? Just in case it helps someone, I faced the same issue. My jar file was under the libs directory and the jar was added to the build path. Still it was throwing that exception. I just cleaned the project and it worked for me. This error is also generated when you make an app that uses the Google API (such as Maps) but run it on a device that targets the Android API. I encountered this NoClassDefFoundError when I used java.nio.charset.StandardCharsets. The reason is that StandardCharsets has not existed until JRE 1.7. If I make the java compile version set to 1.7, Eclipse complained that "Android requires compiler compliance level 5.0 or 6.0". 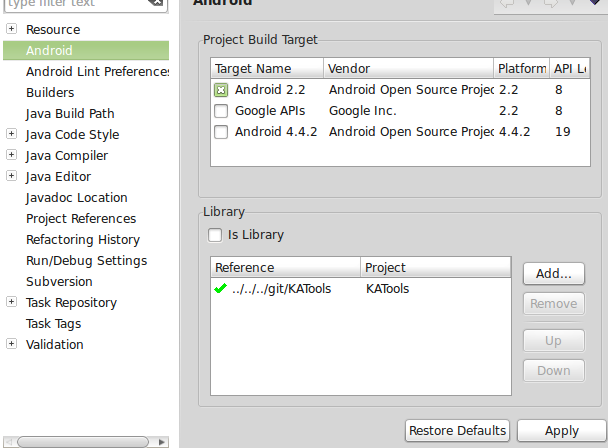 So, I fixed it by right-click the project name->Android Tools->Fix Project Properties. It is compiled with JRE1.6. However, because StandardCharsets has not existed until 1.7. It reported NoClassDefFoundError when I ran it. I has not come to realize this until after trying a lot of other methods including reinstalling JDK. The real reason is clearly told by the meaning of NoClassDefFoundError: The class cannot be found at run time although it passed compilation. General conclusion is that as long as Android does not work with JRE 1.7, if you use any new feature provided since 1.7, you will encounter this error. My solution is that I copied those source code into my code! The Java Error thrown if the Java Virtual Machine or a ClassLoader instance tries to load in the definition of a class (as part of a normal method call or as part of creating a new instance using the new expression) and no definition of the class could be found. The searched-for class definition existed when the currently executing class was compiled, but the definition can no longer be found. NoClassDefFoundError in Java comes when Java Virtual Machine is not able to find a particular class at runtime which was available during compile time. from this page. Check it, there are some ways to solve the error. I hope it helps. For me this problem was related to the API that I was using not being deployed. For example, I used a ZSDK_API.jar as a reference. To fix the issue I had to right click on the project and select properties. From JAVA BUILD PATH, I had to add the API that was not being deployed. This was weird as the app was throwing MainActivity class not found and in reality the error was caused by the DiscoveryHandler class not being found. In my case, I was trying to add a normal java class (from a normal java project) compiled with jre 1.7 to an android app project compiled with jre 1.7. The solution was to recompile that normal java class with jre 1.6 and add references to the android app project (compiled with jre 1.6 also) as usual (in tab order and export be sure to check the class, project, etc). The same process, when using an android library to reference external normal java classes. Don't know what's wrong with jre 1.7, when compiling normal java classes from a normal java project and try to reference them in android app or android library projects. If you don't use normal java classes (from a normal java project) you don't need to downgrade to jre 1.6. You get this error for Android versions lower than 5.0. Other idea. For example, you have class derived from "android.support.v4.app.Fragment". However you made a mistake and inherited it from "android.app.Fragment". Then you will have this error on the Android 2 devices. I have just figured out something with this error. Just make sure that the library jar file contains the compiled R class under android.support.v7.appcompat package and copy all the res in the v7 appcompat support "project" in your ANDROID_SDK_HOME/extras/android/support/v7/appcompat folder. I use Netbeans with the Android plugin and this solved my issue. I am guessing that you don't specify javac's target when creating the common library, so javac automatically uses the latest available target, which is likely 1.7 (Java7) or 1.8 (Java8). dx of Android's build tools < 19.0.0 isn't able to convert Java7 (or higher) bytecode to Dalvik bytecode. I fixed this issue by adding library project path in project.propertied manually. some how eclipse did not added this entry automaticvally along with "add project". so the point where app was trying to refer any componenrt inside lib project it was crashing . jars used to be in the lib/ folder, now they're in libs/ If you use lib, you can move your jars from lib to libs, and remove the dependencies from project properties/java build path because Android will now find them automatically. For me, the issue was that the referenced library was built using java 7. I solved this by rebuilding using the 1.6 JDK. Some time java.lang.NoClassDefFoundError: error appear when use ART instead of Dalvik runtime. To change runtime just go to Developer Option -> Select Runtime -> Dalvik. If none of the above works (like it happened to me), and you're using as a library another project in Eclipse. Activity again added to manifest.I tried in my manifest then app worked. Check api level of views in layout. I faced same problem with searchView. I have check api level while adding searchview but added implements SearchView.OnQueryTextListener to class file. 1)In Manifest file mention your activity name and action for it and also category . 2)In your Activity mention your starting contentview and mention your view id's in the activity. Not the answer you're looking for? Browse other questions tagged android noclassdeffounderror or ask your own question. Adding Android library project to Eclipse build path?